Ordinance will take faculty recruitment to an older formula, by which quotas for SC/STs & OBCs were calculated on basis of institution's staff strength, not individual department's. 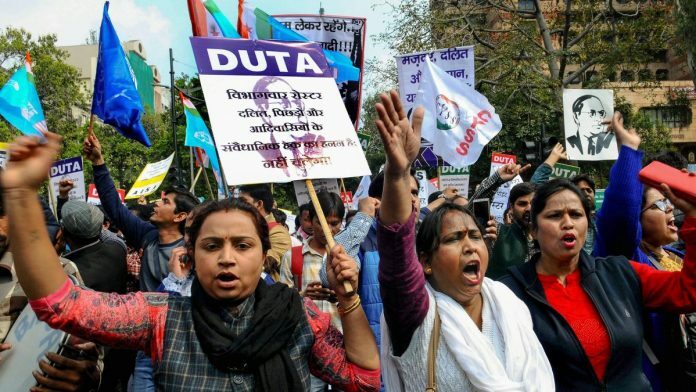 New Delhi: The Union Cabinet Thursday agreed to issue an ordinance to junk a controversial new quota formula for faculty recruitment at universities, allowing a significant policy tweak in its last meeting before the Lok Sabha elections. The ordinance will take faculty recruitment back to an older formula by which the quotas for Scheduled Castes/Scheduled Tribes (SC/STs) and Other Backward Classes (OBCs) were calculated on the basis of an institution’s staff strength, and not an individual department’s. An ordinance — a short-term law the government can bring without parliamentary approval — was the only option the Narendra Modi government had to do away with the department-wise formula after twin Supreme Court snubs in the matter. The ordinance came on a proposal moved by the Union Human Resource Development Ministry, and paves the way for institutions to start hiring again after a year-long stalemate. Calculating quotas by departments was meant to ensure a balanced distribution of beneficiaries across subjects, but critics claimed that it vastly cut the number of posts available for them. As reported by ThePrint earlier, the older formula is believed to be more suitable to the government’s mandate to ensure 27 per cent of reservations for OBCs, 15 per cent for SCs, and 7.5 per cent for STs. This roster system, introduced by the central government in 2006, required at least 14 posts at each level to be able to fulfill the mandate. If a pool of 15 teachers is considered a unit, for example, every fourth position goes to a person from the OBC category, every seventh position to a person from the SC category, and every 14th position to a person from the ST category. But if the department is considered a unit, it becomes difficult to satisfy the mandate as any department is unlikely to have more than 10 faculty members at a particular level. According to the ministry, the ordinance will help fill up over 5,000 vacancies across institutions through direct recruitment. The new formula was introduced by the University Grants Commission through a March 2018 order on the basis of an Allahabad High Court order dated April 2017. The government had challenged the quota in the Supreme Court last year, but lost the argument, with a review petition filed this January squashed as well. In its review petition, the HRD Ministry had described department-wise hiring as a “grave miscarriage of justice”. It said the new system would cause the representation of the SCs in universities to fall by 58-97 per cent, the STs by 78-100 per cent, and the OBCs by 25-100 per cent in recruitment to all posts, i.e. associate professor, assistant professor and professor. This analysis was based on a study performed on 20 universities. The main reason for declination of wards of Central govt is the sub standard syllabus as compared to other private or govt school. Army and Airforce already setup their own schools name as Army public school and Air force school which runs on ICSC syllabus. If u compare both the syllabus , there is a vast difference between the two. The KV syllabus is old fashioned but not bad, just faded in current time which required a revision. Again the availability of teachers and monitoring by the principal is very poor.